SoAD hold Mental Health event with Architects Benevolent Society. The event was a unique opportunity to discuss stress and well-being within the field of Architecture and get a better understanding of how to help yourself when things get tough. Students and staff listened to talks from the Architects Benevolent Society about how the charity works to support Architects in practice and how they engage with students of architecture, architectural technology and landscape courses through their partnership with Anxiety UK . MArch student Una Haran spoke about how making your own sensory first aid kit can help at moments when stress becomes overwhelming. This is a portable kit of items that are unique to you and which stimulate the five senses to provide positive emotional triggers. It can be used at any time – from everyday stress to crisis. School of Architecture and Design Student Support and Guidance Tutor, Justine Devenney also spoke about understanding the Mental Health Continuum and how to seek support sooner rather than later. Students and staff also got to vote for the three most popular designs in a student T shirt competition which has been running in the past few weeks. Designs challenged negative stereotypes that exist around mental health and studying architecture. There were three clear winners whose designs will now be printed on t shirts and sold to help raise money for the Graduate Show. 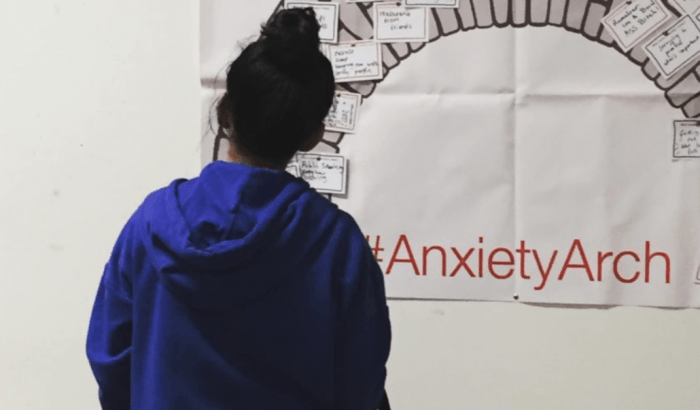 This entry was posted in Architecture and planning, Uncategorized and tagged Anxiety UK, Architects Benevolent Society, Justine Devenney, Mental Health Awareness Week, Una Haran.